People who visit Moscow on a regular basis know there are restaurants in the Russian capital to suit any taste and any budget. Yet finding truly original and authentic places is a real challenge. It’s easy to find a restaurant you recognize in Moscow McDonald’s, Burger King, KFC, Pierre Gagnaire, Nobu, Cristal Room Baccarat cater to global travelers of all budgets. But there are some real culinary gems in Moscow that should be uncovered. This temple of ultramodern meals from avant-garde chef Anatoly Komm offers an insight into and the future of Russian cuisine. The menu features borsch served with foie gras and pampushkas; herring wrapped in beet sheets; dumplings stuffed with Kamchatka crab; and morels with porcino stuffing. There is a special note on the menu declaring that all the ingredients are produced in Russia and are the pride of national agriculture. At the time of writing, Varvary was the only Russian restaurant listed in The S. Pellegrino World’s 50 Best Restaurants. Reservations required. Moscow’s most famous cheburek-house is located in a solid three-story building next to the Sukharevskaya metro station under a signboard reading “Rybachte s nami” (Go Fishing with Us). Druzhba only serves one type of meal – chebureks, which are flat rectangular patties with a filling of ground or minced meat fried in oil. Druzhba has not changed at all since the 1970s and the atmosphere of rough proletarian reality combined with toasts celebrating the Russian soul are enhanced by standard curtains, classic faceted table glasses and people lining up at the counter. In keeping with the rules of the game, people eat while standing up, talk about politics and wash down vodka and cognac shots with beer. A grumpy woman of unidentifiable age in a sloppy smock cleans the tables. There is no restroom. You can wash your hands in a blue basin near the entrance. Chaika, run by Russian culinary experimentalist Dmitry Shurshakov, is located in an imposing modern mansion. The restaurant’s chef is adept at Russian innovative cuisine and combines international gastronomic traditions of the Soviet Union with ultramodern culinary techniques. The menu features “beet with cheese in five forms,” “wild meat,” steamed herring wrapped in black seaweed with mashed potatoes; and bright green crispy risotto with smoked eel and strawberry flavorings. Chaika is one of The S.Pellegrino World's 100 Best Restaurants. Reservations recommended. The Central House of Writers is one of Moscow’s chief gastronomic curiosities. The menu includes refined Russian cuisine dishes with a subtle French accent. The restaurant is unique from the point of view of both gourmets and history enthusiasts. It is situated on Povarskaya Street, in the mansion built for Prince Svyatopolk-Chetvertinsky in 1889. During the Soviet era, the house “looking like a fortress” was given to the Union of Writers. The building featured one of the most exclusive restaurants in the Soviet Union and was for club members only. Most of the items of the interior, including hearths, Florentine tapestries of the late 16th century, the chandelier that Stalin once presented to Gorky, and sandalwood pillars are genuine. A typical representative of a once-popular concept that has miraculously survived since Soviet times. A “pelmennaya” is an invention of the Soviet government, which modified original Russian taverns into cheap eateries specializing in certain dishes and serving alcohol. There is only one table in Pelmeni – you are supposed to eat while standing up at counters. Legend has it that Joseph Brodsky liked eating and drinking here when visiting Moscow. To take in the spirit of Socialism, you need to order a proletarian business lunch of that era: a dish of hot (dumplings), a bottle of Zhigulyovskoe beer and 50 grams of Stolichnaya vodka. The menu also features soups, salads, pilaf, and cabbage patties. A Moscow architectural marvel, this three-floor Baroque chinoiserie palace was built to the highest standards of decorative arts. Turandot is the first Russian restaurant built for purposes other than to recoup the investments as soon as possible, and is one of the world’s most expensive restaurant projects (investments are estimated at $50 million). The restaurant named after a beautiful Chinese princess features not only an intricate interior but also exquisite palace cuisine, incorporating dishes of European, Japanese and Chinese origin. Most Moscow metro passengers are unaware that there are cafeterias located right on platforms of some stations. Naturally, the main customers are drivers, policemen and other employees of the metro, but others are also allowed inside. The cafeteria on the Arbatskaya station platform is a unique location that has remained unchanged since Soviet times. There are only three tables in this miniature café. The laconic menu includes soup, sausage, pilaf, meatballs, fried fish, boiled eggs, stuffed patties and kompot. Similar cafeterias operate on the Kievskaya (Arbatsko–Pokrovskaya Line) and Voikovskaya station platforms. 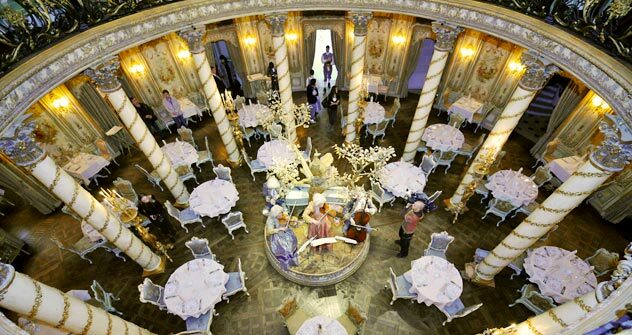 A luxurious restaurant-palace, Yar is one of the oldest in the city and the main place of entertainment in Moscow before the 1917 Revolution. The restaurant was founded by Tranquille Yard, a Moscow merchant of French origin, on Jan. 1, 1826. Legend has it that he founded the restaurant with money earned from horse racing. Members of the most prominent Russian dynasties – Pushkin, Rasputin, Tolstoy, Chekhov, Kuprin, Blok, Esenin, Mayakovsky, Gorky, Chaliapin, Repin, Vrubel, etc. – were among Yar’s regular customers. During the Soviet era, the restaurant catered exclusively for important guests of the Soviet government and distinguished party comrades. In 1952, Stalin ordered that the Sovetsky Hotel, the official government residence, be attached to Yar). Today, Yar is an entertainment restaurant, a sort of Moscow Moulin Rouge with a distinct Russian flavor – a large, two-level stage, long-legged girls in Firebird costumes, acrobatics, bears, gipsy songs and loads of luxurious Russian dishes with a touch of antiquity.